Star wars. Episode IV, A new hope [videorecording] / 20th Century Fox ; Lucasfilm Limited production ; written and directed by George Lucas ; produced by Gary Kurtz. by Lucas, George, 1944- [drt, aus] | Kurtz, Gary [pro] | Ford, Harrison, 1942- [act] | Fisher, Carrie [act] | Hamill, Mark [act] | Jones, James Earl [act] | Williams, Billy Dee, 1937- [act] | Guinness, Alec, 1914-2000 [act] | Cushing, Peter, 1913-1994 [act] | Lucasfilm, Ltd | Twentieth Century-Fox Film Corporation | Twentieth Century Fox Home Entertainment, Inc.
Star wars. Episode II, Attack of the clones [videorecording] / 20th Century Fox ; Lucasfilm ; directed by George Lucas ; screenplay by George Lucas and Jonathan Hales ; produced by Rick McCallum. by Lucas, George, 1944- | Hales, Jonathan | McGregor, Ewan, 1971- | Portman, Natalie, 1981- | Christensen, Hayden, 1981- | McDiarmid, Ian | McCallum, Rick, 1952- | Tattersall, David, 1960- | Oz, Frank | August, Pernilla, 1958- | Best, Ahmed, 1973- | Davies, Oliver Ford | Daniels, Anthony | Baker, Kenny, 1934- | Williams, John, 1932-. Star wars | Twentieth Century-Fox Film Corporation | Lucasfilm, Ltd | Twentieth Century Fox Home Entertainment, Inc.
Star Wars. Survivor's quest / Timothy Zahn. Star Wars. Lost stars / written by Claudia Gray. The approaching storm / Alan Dean Foster. by Foster, Alan Dean, 1946-. The courtship of Princess Leia / Dave Wolverton. The princess diarist / Carrie Fisher. 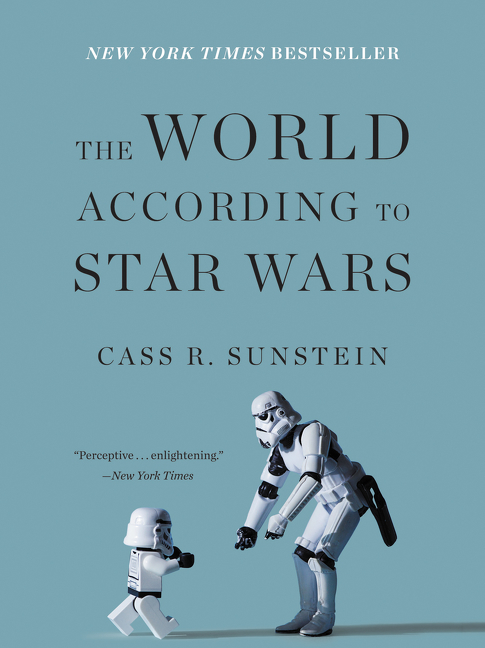 The world according to Star Wars / Cass R. Sunstein. by Sunstein, Cass R [author. ].